There is nothing better than homemade mozzarella cheese sticks, and you only need 4 simple ingredients to make them. The air fryer makes them super crispy without having to use all the oil you would use while deep frying. Serve as an appetizer for happy hour at home or while you watch the big game on game day. Try panko bread crumbs instead of the Italian-style bread crumbs, if desired. Make these gluten-free by using gluten-free flour instead of the all-purpose flour and gluten-free panko bread crumbs instead of Italian-style bread crumbs. Per Serving: 352 calories; 20g fat; 20.4g carbohydrates; 22g protein; 122mg cholesterol; 726mg sodium. This recipe is definitely going into my game day book of eats. This recipe was outstanding and super easy to make. 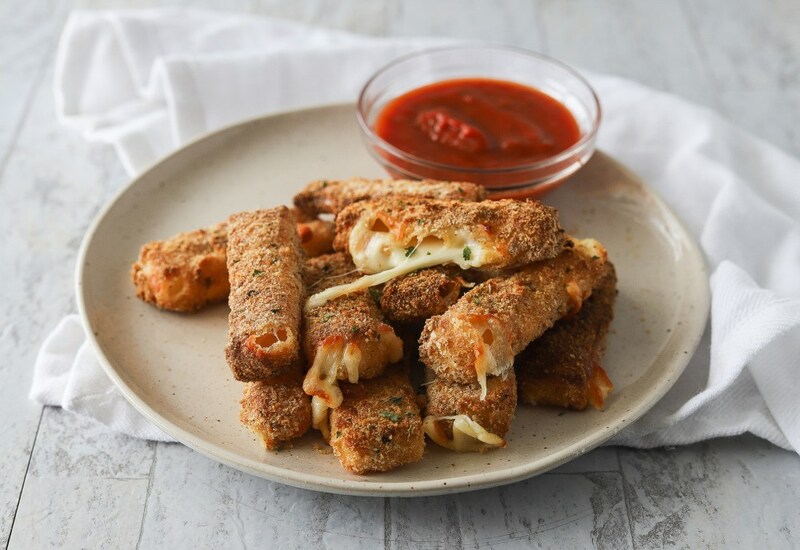 I was looking for something to pair with some wings in the air fryer for March Madness and came across these cheese sticks. I used some string cheese we had in the fridge instead of block mozzarella. I tried this recipe over the weekend and it was pretty good. I followed the instructions and the only change I made was I wrapped some pepperoni around the cheese before the egg wash and breading.